Have the chilly winds of this week made you open up your winter closet to take out your coat and scarf? Yes, we too can definitely feel that winter is here! It’s trying to creep under our door and it’s now time to ‘pack away’ the bbq and instead, fire up the stove to cook hot meals to fill our bellies with hearty, healthy food! For Hart & Soul, pumpkin soup has to be at the top of the soup list; it’s straightforward and filling with just a few ingredients. The beauty behind this new flavour is that you can use it as a base to create your own recipe or eat it just like it is, though we absolutely love to see all your genuine creations! The following recipe has been created by Holly, aka @thehealthyhunter. 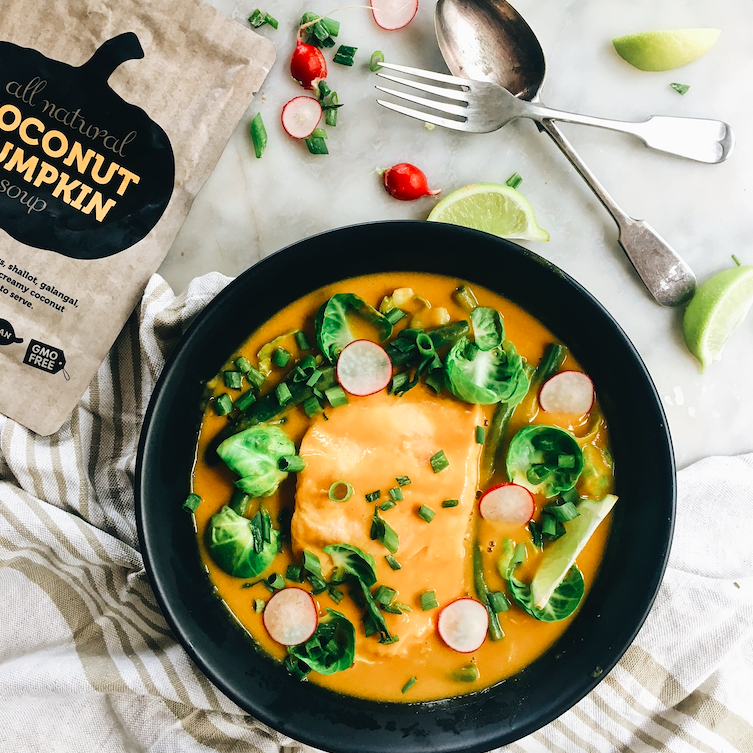 A smart mix between the sweetness of the coconut, the smoothness of the pumpkin and the richness of the salmon; a ‘go-to’ when you don’t have much time to cook dinner though still fell like a warming and healthy meal. Place salmon and soup in a small pot over medium heat. Slowly bring to a boil and turn down to a simmer. Cover and simmer for 2 minutes. Add green beans and simmer for 2 more minutes. Turn off the heat, add the Brussel sprout leaves and replace lid. Leave for a minute. Serve in a shallow bowl, with the salmon in the centre and the soup poured around it. Garnish with spring onion and radish with lime wedges on the side.